The second generation Fiat Panda is a sturdy, compact city car that was completely remodelled back in 2003, its funky good looks and spacious interior earning it the accolade of European Car of the Year in 2004. A safety-conscious urban runaround, it’s the car of choice for eco-conscious drivers and is amazingly cheap to buy and run. The entry-level Panda boasts a group 1 insurance banding and you can’t get much cheaper than that! Opt for the 1.3-litre diesel and you’ll get a whopping 65.7mpg and some pretty decent kit. Not bad for a city car that will transport the kids, pets and shopping without harming the environment too much. Getting in and out is easy with higher positioned seats and five-doors, making it ideal for both young and old passengers. With 10 models to choose from you can find one to match your needs and your budget – opt for the 4x4 version with its 1.2 litre petrol engine for a sporty ride and a reasonable off-road performance. All models come with power steering, driver and passenger front airbags, electric front windows, central locking and anti-lock brakes. Upgrade for body-coloured bumpers, remote locking and a CD stereo, or go top of the range with the Eleganza, which comes with sporty alloy wheels, climate control and roof bars. The light and airy cabin means that this is a delight for taller drivers, with masses of headroom and an elevated driving position for great visibility. For a family-focused version try the Panda Mamy. Designed with the busy mum in mind, you’ll get two rear-view mirrors (one for keeping an eye on the kids), washable upholstery, and handy grip-mats and bag hooks in the boot. For off-road action opt for the rugged 4WD Panda Cross, with its elevated suspension and chunky bumpers to protect from the mud. For great Italian design and a reliable, hard-wearing performance, the cheeky Panda hatchback is definitely one to look at. 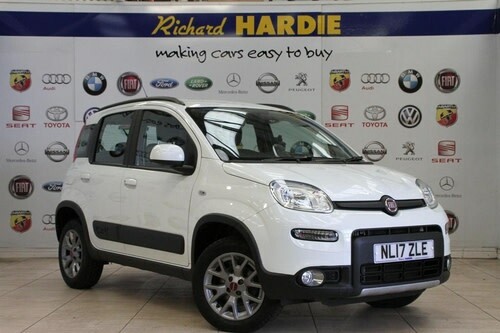 For a practical, affordable, safety-conscious car that loves the city, take a look at the easy-access Fiat Panda.